Farrier Michael Bell spends some time each week with the least glamourous horses in the equestrian world. He's the farrier at Horse World, the Friends of Bristol Horses rehabilitation farm in Bristol, England. You'll find him rubbing up against the horses with sweet itch, mange and he probably sometimes feel a bony hip poking him...a bony hip that should be padded with flesh. Take a moment to read the shelter's nice article about how much they appreciate Michael, and consider the neglected hooves of the rescue foundered pony, below. The owner received a two-year ban from owning horses and was forced to pay over $3000 in fines and court costs. 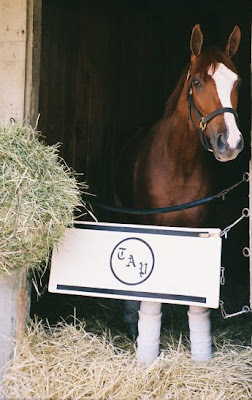 Note: “Friends At Work” is a regular feature of Fran Jurga's Hoof Blog. When newspapers and web sites alert us to features on our hard-working readers and friends, I sometimes can figure out how to link to the story and share the photo with blog readers. Preference is given to people who aren’t normally in the news…and the more exotic the locale, the better! Scroll down the blog to read more "Friends at Work" posts from all over the world, or use the "search" box at the upper left of this page to find more "friends". You could be next! Legendary Dutch trainer Tineke Bartels (also mother of team rider Imke Schellekens-Bartels), team farrier Rob Renirie and Dutch Olympic sports coordinator Ad Wagemakers. The World Cup Dressage Finals may be only a few days away, but the Dutch dressage team has set its eyes on Hong Kong. Last week, the short-listed horses and riders who will likely represent the Netherlands at the 2008 Olympics were inspected by a trio who have their best interests at heart: team veterinarian Jan Greve, team farrier Rob Renirie, and Dutch Olympic team sports coordinator Ad Wagemakers. Sjef Janssen is once again trainer for the dressage team; he organized a group session at his headquarters in Erp. The Dutch will have home court advantage at the World Cup this weekend; it will be held at ‘s-Hertogenbosch, The Netherlands. Learn more on the website of Dutch rider Anky Van Grunsven. Team vet Jan Greve listens to the heart of Dutch team prospect Hunter Douglas Sunrise, as rider Imke Schellekens-Bartels holds him. Note: all photos used in this post reside at anky.nl. Thanks, Anky! Rags to Riches in Saratoga last summer. Photo by Fran Jurga, no use without permission, which is easy to obtain. There were plenty of riches along the way, but 2007's top filly, Belmont Stakes winner Rags to Riches is leaving the racetrack forever. Trainer Todd Pletcher announced today that she re-injured her pastern, which just healed from a hairline fracture. Thousands of American racing fans and horse lovers simultaneously sighed when the news hit. After a combination of fevers, injuries and a dismal return to racing for a single race last fall, Rags seemed destined to live in her own shadow. Did she run her heart right out when she battled 2007 Horse of the Year Curlin to the wire in the Belmont last June (and beat him, after running a mile-and-a-half)? We'll never know. But Curlin came back and regained his winning ways. There was never a re-match between the top filly and top colt. 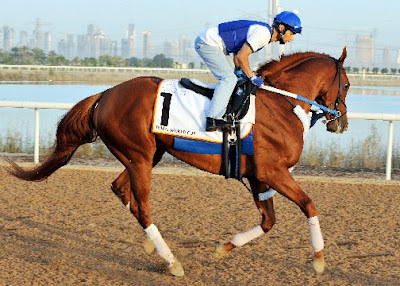 He'll run this weekend in the Dubai World Cup and hopefully will return to the States for the Grade 1 older horses stakes circuit this summer. I know what you're thinking and I agree. Rags will be bred immediately to Giant's Causeway, a top sire and a stunning racehorse. But maybe in a year or two, let's hope the Ashford Stud powers-that-be have a romantic side and breed her to Curlin once he retires (hopefully, safe and sound). But I'm happy to watch him race for as many years as his connections will let him. Rags was great for racing, while she lasted. She even had her own blog. I'm sure hers got a lot more traffic than mine...and I wouldn't have it any other way. You can relax now, filly. Dr. Conklin with the famous Quarter horse mare Royal Blue Boon, who was one of his patients when she suffered from laminitis. The mare is the leading dam of cutting horses, and the dam of the great Peptoboonsmal. "She is living out her days at her owners' ranch, is virtually pain free from the laminitis and hasn't had any complications in over a year. She has arthritis but gets along really good for being 27 years old," says Conklin's technician, Kelsey Bohannon. In just a week, the doors will open on a new podiatry center in the heart of cutting horse country in Weathersford, Texas, west of Fort Worth. The 3,000 square foot, climate-controlled Podiatry Center at Reata will be the realization of a lifelong dream for Dr. Britt Conklin, a certified farrier and equine-specialist veterinarian, when it opens on April 1, 2008. The new facility includes a complete farrier shop, several treatment areas, four stalls and a conference room. Clients will have the benefit of state-of-the-art diagnostic equipment such as Eklin digital radiography, venograms, GE Logiq 5 Ultrasound, MRI and bone scan modality access. Local farriers will have access to the facilities and diagnostic equipment to allow them to better serve the needs of their clients. Cutting-edge treatments and services will include shock wave therapy, IRAP, stem cell therapy, sling and high scale bedding parameters, and customized diet, nutrition and rehabilitation plans for patients. 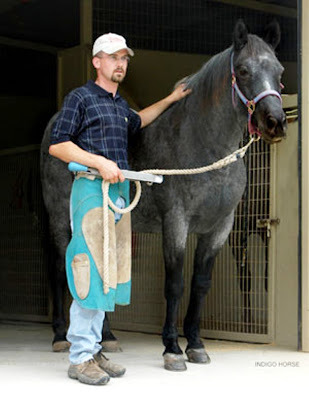 Dr. Conklin worked as a farrier to put himself through undergraduate school at Texas Tech University and attended veterinary school at Texas A & M University. While at A&M, he apprenticed under Danny Taylor CJF, PhD, who in turn worked in conjunction with Dr. David Hood on "The Hoof Project"; Taylor earned his PhD for his research in the biomechanics of the equine foot’s digital cushion. Dr. Conklin is co-owner of Reata Equine Hospital, and he has dedicated the majority of his practice to equine podiatry. He is very passionate in his research and is continually working to find new and more improved ways to prevent and treat laminitis. “We do 90 percent of our work on cutting/reining horses, but have several dressage/eventing barns as well,” Dr. Conklin writes. Reata Equine Hospital is a seven-doctor referral practice, located five miles south of I-20 in Weatherford, Texas. It houses complete reproductive, surgical, sports medicine facilities in addition to the new podiatry center. Veterinarians on staff include a board certified theriogenologist, surgeon, and certified farrier. For additional information on The Podiatry Center at Reata, please contact Kelsey Bohannon by phone at 817-599-9635 or via e-mail at brittconklindvm@reataequinehospital.com. Dr. Conklin bandages a patient's legs. LEXINGTON, KY- The World Games 2010 Foundation today announced that the American Farrier's Association has been named the Official Certified Farriers of the 2010 Alltech FEI World Equestrian Games. As the Official Certified Farriers, the American Farrier's Association will provide a farriery on the venue grounds of the Kentucky Horse Park from September 11 until October 10, 2010. Two farriers will be on site per day for the two weeks prior to the Games, and up to six farriers will be on site daily during the 16 days of competition, depending on the event schedule. Athletes will be charged on an individual basis for farrier services according to their needs. "We are so pleased to have this partnership with the American Farrier's Association," said Competition Director Kate Jackson. "We know that the equine athletes competing in these world championships will be in professional and skilled hands." "Naming the American Farrier's Association as the Official Certified Farriers of the 2010 Alltech FEI World Equestrian Games constitutes a true honor for our organization. While this event showcases competition, it's genuinely built upon cooperation, and our association is pleased to be a part of this international effort that will bring us together in Lexington," said Andrew Elsbree, CJF, President, American Farrier's Association. "We look forward to 2010 and the opportunity for our AFA Certified Farriers to offer participants the finest in hoofcare services." Headquartered in the Kentucky Horse Park's National Horse Center, the American Farrier's Association (AFA) focuses on improving equine welfare through excellence in the practice of hoofcare and farriery. As North America's premier farrier organization, the AFA centers upon five basic tenets: certification, education, communication, research, and innovation. Working through the AFA's education and certification programs, AFA farriers provide exceptional, professional services for horses and the people who use and enjoy them. "Many of the horses competing in the Alltech FEI World Equestrian Games will be there, in part, due to the ongoing, exceptional work of AFA Certified Farriers," said Elsbree. "We are honored to have the opportunity to continue providing excellent care throughout the Games." The Alltech FEI World Equestrian Games, to be held at the Kentucky Horse Park September 25-October 10, 2010, are the world championships of the eight equestrian disciplines recognized by the Fédération Equestre Internationale (FEI), and are held every four years. The Games have never before been held outside of Europe, nor have all eight disciplines ever previously been held together at a single site- both firsts that will be achieved at the Kentucky Horse Park. The 2010 Games are expected to have a statewide economic impact of $150 million. It is anticipated that more than 600,000 spectators will attend the 16-day competition. 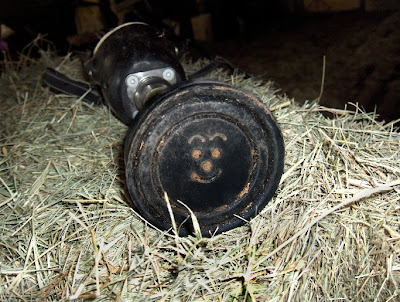 Photo highlights from the first 500 posts on Fran Jurga's Hoof Blog. 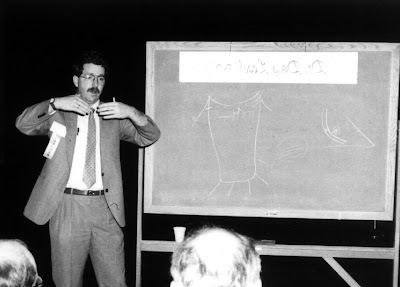 Sometimes a good idea sticks, and that has been the story with this blog. We now have 500 stories posted here and hundreds of people visit this blog daily...from every corner of the planet. Most zip in to grab details of a single story (Tildren and collateral ligament injuries are always at the top of the list) or watch a video. Others, mostly loyal Hoofcare and Lameness Journal subscribers, start at the top and read the new posts each day. An uncountable number of people read this blog by email now and many more read an RSS feed of the headlines on their Yahoo/Google/AOL newsreader pages (but miss all the photos and videos). This blog now have a "widget" of code that will display the headlines on anyone's web site or blog (just ask). No matter how they read it, people do read it. I know because so many leave encouraging or disparaging remarks, usually by email. These remarks either make or break my day. The only thing that gets me up in the morning (or keeps me up late at night) to post these stories is the positive feedback from the people who tell me that they check the blog before they head out off to work or the barn/track/forge/clinic or when they get home at night. That, and wanting to share with you all the news of the hoof. It's just too interesting to keep to myself. Thank you all for reading and for the emails and occasional comments. Thanks for being patient about the erratic publishing schedule of Hoofcare and Lameness. Thanks for being not passive readers of the news, but the makers of the news. This blog is yours. The second Welfare and Safety of the Racehorse Summit will be held Monday, March 17, and Tuesday, March 18, at the Keeneland Sales Pavilion. 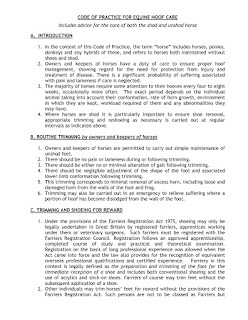 Most of the topics to be covered will be of great interest to Hoof Blog readers, in particular reports on committee studies of hoof care and horseshoeing, synthetic racetrack surfaces and injuries in racing. Fran Jurga of Hoofcare Publishing will be one of 60 participants in the study groups. Fran joins shoeing and hoof care committee members Bill Casner (chair), Dr. Rick Arthur, Ed Bowen, Bob Curran, Bob Elliston, Dr. Rob Gillette, John Harris, Richard Mandella, Chris McCarron. Wayne McIlwraith, Dan Metzger, Steve Norman, Denny Oeschlager, Dr. Mick Peterson, Todd Pletcher, Richard Shapiro, Dr. Scott Stanley, Gary Stevens, Dr. Sue Stover and Mitch Taylor. Mitch Taylor of Kentucky Horseshoeing School will present high-speed video studies of racehorses galloping on different surfaces wearing different shoes. Mitch has been building on his initial filming of horses with and without toe grabs that he presented at the "Hoofcare@Saratoga" forum last August and at the 4th International Equine Conference on Laminitis and Diseases of the Foot in November. In the synthetic surfaces study group, Dr. Preston Hickman of the Wichita Equine and Sports Medicine Clinic, who also uses video analysis technology, will examine the potential causes of on-track injuries. Hickman was a farrier before becoming a veterinarian and is certified by the American Farrier's Association. He is a proponent of Dartfish motion analysis software. Below are some examples of Dartfish "Stromotion" images from the Dublin Horse Show and a short example of a clip of Dr. Preston's high-speed video. This might be the most important meeting of the year. There is no charge to attend for audience members; there will be two public sessions, one of Monday morning and one on Tuesday afternoon (see schedule). Please contact the Jockey Club for more information: (859) 224-2850. All HoofBlog text and images © Hoofcare Publishing 2006-2008 unless otherwise noted. Please request permission to reproduce or capture images or content. This blog is available for delivery via RSS feed or as a daily email of new content. 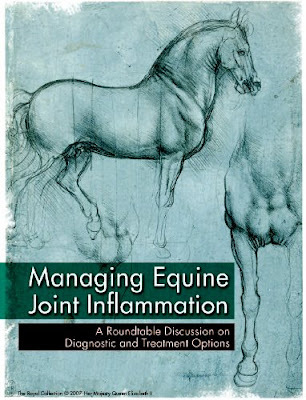 Our friends at Idexx have a free download of a roundtable discussion featuring leading university lameness veterinarians at Colorado State University and Texas A&M University on the topic of joint inflammation. If you click on this link the download should start. 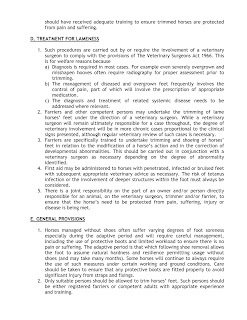 The document is a 2.4MB Adobe Acrobat (PDF) file created by Veterinary Learning Systems. You should end up with a 16-page document that you can print or read on your screen. 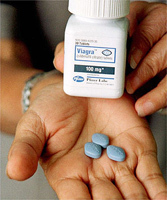 Idexx is the manufacturer of Surpass, a topical anti-inflammatory medication, and many other medications and products for equine veterinary care. 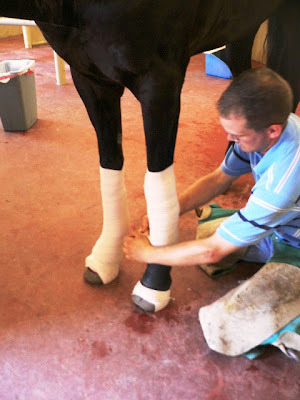 The special report covers all aspects of new developments for equine joint problems. You hear a lot these days about cloning horses. Top showjumpers, endurance horses, and especially those down-in-the-dirt cutting horses can now have their DNA recycled into a genetic match. From where I sit, we need to not clone the horses but the horsemen, those people of either gender who are superb at understanding how to care for horses and, in particular, how to nurse them back to health after illness or injury. We've always had layup farms, some of which include physical therapy, but most of which are benign holding facilities where racehorses can get some fresh air and a few hours in a paddock each day before they return to the track or maybe put on a few pounds and some dapples before they head to the sales ring. But what if you had a dressage horse with a suspensory problem, a steeplechaser with a bad bow, a racehorse recovering from EPM and you couldn't provide the nursing care? Where would you send your horse? Who would you trust to bandage and medicate and just plain care for that horse? We live in a day of revolving barn helpers; if Miguel can't make it today, he sends his cousin, but his cousin isn't quite the poultice artist Miguel is. And if you're working on layups, poultice needs to be your art form. My vote for cloning would be the people who are so good at care of lame horses. Whether it's a barefoot rehab farm or a high-tech racehorse recovery center, the care and results will only be as good as the skills and experience of the people who have their hands on the horse, day in and day out. The best intentions and Internet consultations won't take the place of "been there, done that, can do" and that takes years of experience and hundreds of horses to gain. So we come to the story of Nicole Roberts. I'd like to say I know her, but I don't. I do know Dr. Midge Leitch, the vet who recommends that owners turn their recovering horses over to Nicole for care. Today's Philadelphia Inquirer has an article about Nicole and her "halfway house" for recovering horses outside Kennett Square, Pennsylvania. The point of asking you to read this article is not that you will learn something about lameness, but that you will remember that there are people out there like Nicole. I hope she takes on apprentices. It would be easy to say that she should write a book or make a dvd, but there is no substitute for hands-on experience with horses. Combine that experience with a genuine "feel" for horses and you have a valuable, if oft unsung, hero of the horse world who can often bring a horse back without sharing credit with high tech treatment tools or holistic cure-alls. That's what they are talking about when they talk about horse sense. I hope you will take time to read the article and reflect on the role that people like Nicole play in our industry. Thanks to twincities.com for this video clip of underwater treadmill at the University of Minnesota College of Veterinary Medicine's new Leatherdale Equine Center in Falcon Heights, Minnesota. You're watching a Hanoverian recovering from arthroscopic fetlock surgery enjoying some physical therapy, with some nice closeup photography of the hooves underwater and a brief glimpse of Dr. Stephanie Valberg, the center's director. Thanks to everyone who has suggested placing a Transatlantic wager on the Scottish horse Big Eared Fran, who is entered in the Cheltenham Festival's Championship Bumper this week. The Festival is the biggest jump racing event in the year's calendar in the UK and creates quite a frenzy. Big Eared Fran is by the famous flat racing sire Danehill and originally was destined for flat racing with the Coolmore Stud but has changed hands (and racing genres). Trained by the legendary Martin Pipe, the horse is named for his current part owner, former England and Rangers football player Francis Jeffers. A win by a Scottish-owned horse at "the biggest show on turf" would be a Seriously Big Deal, since the festival is normally dominated by Irish horses and trainers. The horses to watch are the super star Kauto Star and his stablemate Denman, both entered in the Cheltenham Gold Cup. Kauto Star is recovering from a foot abscess but is expected to start. Cheltenham is in the scenic Cotswolds district of England, west of London. To make the festival more challenging, southern England is bracing for the arrival of the storm that swept across the USA this weekend. Gale-force winds and torrential rains are predicted, which will make the "going" soft and deep, which is tough on jumping horses attempting Cheltenham's long, long course of what we Americans would call brush jumps. Animal rights advocates are highly critical of the number of horses injured and killed at Cheltenham each year. 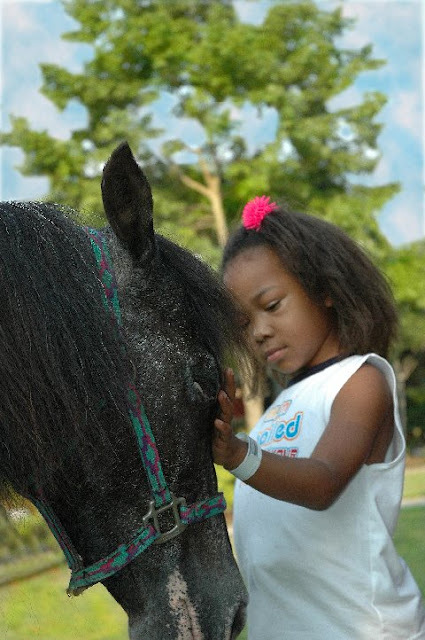 During the 2006 Festival, 11 horses perished in just four days. In protest, a woman dressed in black gothic robes representing a mourning costume will be present at the Festival. She will be wearing a wide-brimmed hat that features a model racehorse tumbling over a hurdle. Cheltenham is also noteworthy for its popular amateurs-to-ride races. Thanks to June Evers of Horse Hollow Press in New York for forwarding this clip of a young Belgian jump prospect. Assuming that this horse didn't break or rupture anything when he landed is testimony to the miraculous design of the equine limb. The horse, whose name is Gesalme, is said to by Espom Gesmeray (you may remember him from the Athens Olympics in 2004) and is promoted by Béligneux-le-Haras. Dr. Hannah Galantino-Homer, senior research investigator of the newly created laminitis research initiative at the University of Pennsylvania School of Veterinary Medicine, is beginning her research in 2008 with a grant from Grayson Jockey Club Foundation. “Molecular and Cellular Level Studies of Laminitis” is the title of the project. Currently, laminitis still is so baffling to scientists that researchers tend to be split into two camps (theories) as to cause of the problem — vascular and enzymatic. “The lack of agreement about the basic pathophysiology of laminitis explains why standard guidelines for therapy are not yet available,” noted Dr. Galantino-Homer in her research statement. If this project can identify which specific genes and proteins are up-regulated or down-regulated during the first phase of the disease — when identifiable symptoms are not yet manifested — it “will determine the pathways of the disease and allow institution of preventive or interventional treatments sooner,” according to Galantino-Homer. 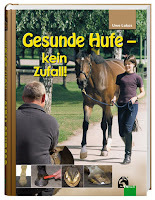 The first phase of laminitis, the developmental phase, is followed, of course, by the acute phase. One of the frustrations of dealing with the disease is that often by the time it is diagnosed, the horse may be gravely threatened. Galantino-Homer believes the study “will provide information that we and other investigators can use to verify or elaborate on existing theories about laminitis, explore previously unrecognized cellular and molecular events during laminitis, and validate in vitro models of laminitis.” The latter will facilitate research projects that do not require laminitic horses. Click here for information about Galantino-Homer's appointment at PennVet. In India, shoes from black horses are considered lucky, meaning many horses are continually and carelessly re-shod by poor owners simply to feed the "lucky horseshoe" trade. Yes, it has to be a shoe from a black horse. Vets from the international equine charity "The Brooke" (Brooke Hospital) in Delhi witnessed this in a black horse called Kalu, who was brought to them in pitiable condition. 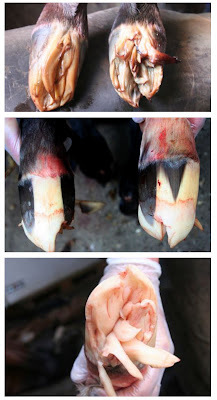 Kalu had overgrown, cracked and severely damaged hooves caused by years of re-shoeing (but not necessarily re-trimming) and was suffering chronic foot pain. Brooke vets helped the horse and taught his owner, Bhoora, better shoeing skills, although he looks like he is pointing a very sharp object at Kalu's sole in this photo. "Now Kalu is happy to be with me," says a grateful Bhoora. The Brooke’s mobile vet teams and community animal health workers, and partner organizations worldwide provide free treatment to animals and train animal owners, local healers, farriers, saddlers, feed sellers, harness and cart makers. They currently operate across nine countries in Asia, Africa, Central America and the Middle East with over 750 highly-skilled staff working directly in the field. 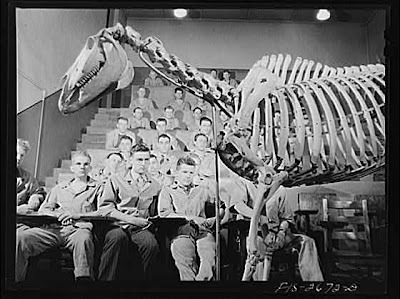 The Brooke Hospital was organized in Cairo, Egypt in the 1930s to assist in the care of thousands of surviving American, Australian and British military horses that had been abandoned there at the end of World War I. Their reward for gallant service in war was a lifetime of hard labor on the streets of Cairo and as they aged, their health suffered terribly. However, the horses were so valuable to their owners' survival that the only humanitarian recourse was a campaign to improve their health. A first equine hospital was built...and the rest is history. Please support the efforts of charitable organizations who put teams of professionals in the field and at disaster sites to help horses. Some day they might show up to help you. Would anyone care to comment on these 12th century horseshoes from the Museum of London? Yes, that's right: 12th century. That means these shoes were hammered out not long after the Battle of Hastings (1066) when the Normans beat the local Brits. According to Sparkes, there is evidence that horseshoes were not deviced to protect horses' hooves, as is so often put forward. He claims that the nails were like keys, and were only nailed halfway into the hoof, in order to provide traction; the heel calks were built up to the same height as the protruding nail heads. What you see in these nail holes is, of course, a spent hole that looks like it was made by a t-shaped punch, but an argument could be made for a t-shaped nail head wearing down into the soft iron of the shoe. If Sparkes' theory holds, the shoe would last much longer than the nails and go through a sequence of nails as they wore down. If a modern design nail sat in that hole, you'd end up with a semi-fullered (creased) shoe. Various historical references quoted by Sparkes place the introduction of fullering in the mid-16th or 17th century. Photo courtesy Museum of London. Check out this detail from an old photo for sale on eBay this week. It's from a collection of photos of the Ringling Brothers Barnum and Bailey Circus in the late 1930s or early 1940s. The credit is given to a photographer in Chicago. The entire image includes a performer perched on the horse's back while he's being trimmed! The leading contributing researcher and author on the equine hoof of the 20th century died on February 10th in Lexington, Kentucky. 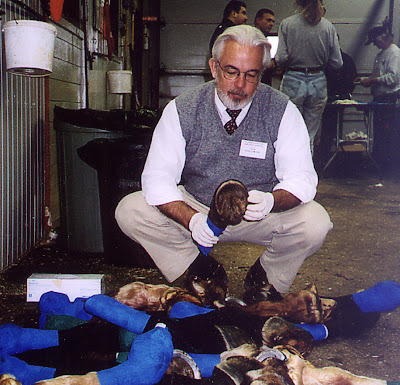 Douglas H. Leach PhD authored major studies on the basic mechanics and anatomy of the hoof in the 1980s, and went on to write about racetrack surfaces, exercise physiology, equine locomotion and a dozen aspects of the hoof's physiology. His name is probably the most often seen in reference lists and research citations. 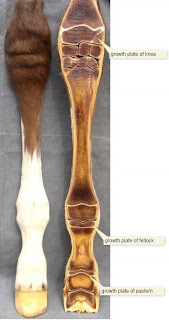 Leach believed that basic studies of the normal hoof were tantamount to studying laminitis or the function of certain shoes, so his papers created a very valuable base on which more specific studies could be built. A native of Canada, Leach received his Bachelor and Masters of Science degrees at the University of Guelph and Ontario Veterinary College, then proceeded to the University of Saskatchewan to complete his PhD on the equine hoof, which he earned in 1980. While at Saskatoon, he co-authored papers with Dr. Hilary Clayton, who was conducting research at the Equine Locomotion Laboratory there and also spent a sabbatical year at the Animal Health Trust in Newmarket, England, where he pursued studies of the function of the navicular bone with collaborating researchers Chris Colles and Sue Dyson there. Leach was so intent on studying the hoof that he learned to read German so he could reference old shoeing and anatomy texts. He collaborated with researchers at Utrecht, Vienna and Uppsala and cheerfully corresponded with veterinarians and farriers from all over the world. Dr. Leach played a major role in the First International Seminar on Navicular Disease in 1984 and authored a monograph summary of the papers presented there for Hoofcare and Lameness Journal. 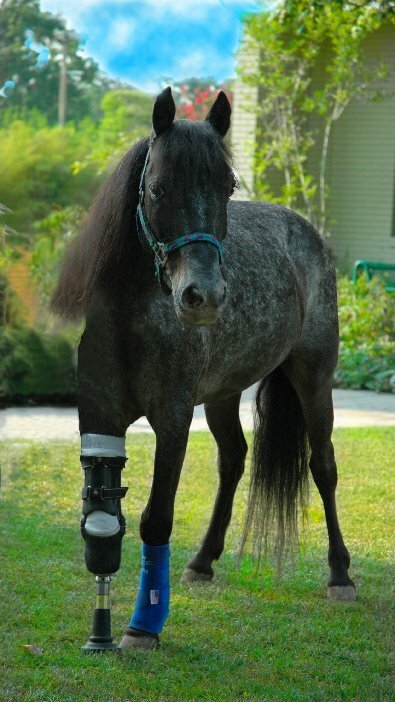 He was a key contributor to Hoofcare and Lameness in its early years. In 1990, Leach was appointed to the John S. and Elizabeth A. Knight Professorship in Equine Veterinary Science at the University of Kentucky. The professorship was expressly created to study causes and prevention of equine lameness. Soon after moving to Kentucky with his wife, Jane, and their three sons, Dr. Leach became ill and was ultimately diagnosed with Pick's disease, a rare and incurable degenerative brain condition. Reading Dr. Leach's papers today, it is hard to believe that most are 20 years old. The best collection of his papers is in the University of Sydney's 1990 proceedings book Equine Lameness and Foot Conditions; it contains six of Leach's last papers, and a seventh on racetrack surfaces co-authored with Dr. Bill Moyer. Dr. Leach was 56 years old when he died. There is no way to estimate how different veterinary medicine and farriery might be if he had been able to continue his study of the foot. What he accomplished in ten short years is an impressive mass of work that will be studied and referenced for years and years to come, but which was only the beginning of a brilliant career cut tragically short.